Located on the east bank of Garonne River, Riveo is a new mixed-use housing complex which will house 308 apartments, retail spaces, a rooftop restaurant, and a communal park in a densely mixed environment. 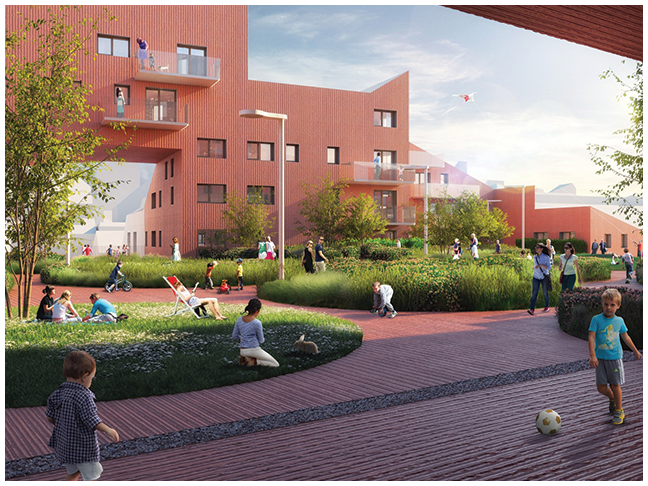 The complex will integrate into the neighboring ZAC Bastide-Niel masterplan by MVRDV to create a lively urban neighborhood aimed at combining the virtues of the historic city–intimacy, surprise and liveliness– with the density, ecology, light and comfort of the modern city. 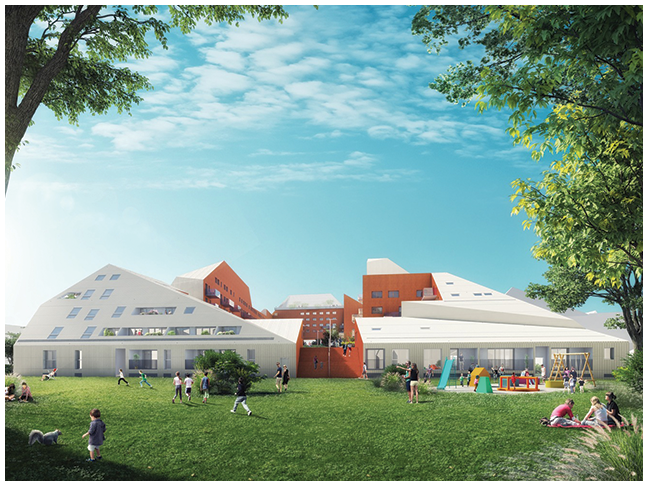 The form of the complex was determined by following four core principles: abundant daylight, natural ventilation, winter light access, and respect for neighbors. The resulting monolithic building features angled cuts that offer views towards the river and the World Heritage Site-designated city center. The facades have been carved with 45 degree angles to open up the building in response to the climate and to create innovative housing arrangements. Along the riverfront, the complex’s largest building will be adorned with a distinctive gold-splashed facade on several faces, as well as ceramic tiles to provide a textured effect. At the peak of the front building, the glass-enclosed rooftop restaurant will offer panoramic views of the city. The result is ‘a true Grande Dame’ which stretches from very low pavilion-like housing towards the neighbourhoods at the back and more ambitious and monumental where the scale permits to do so, for example at the Garonne riverside facing the historic left bank. 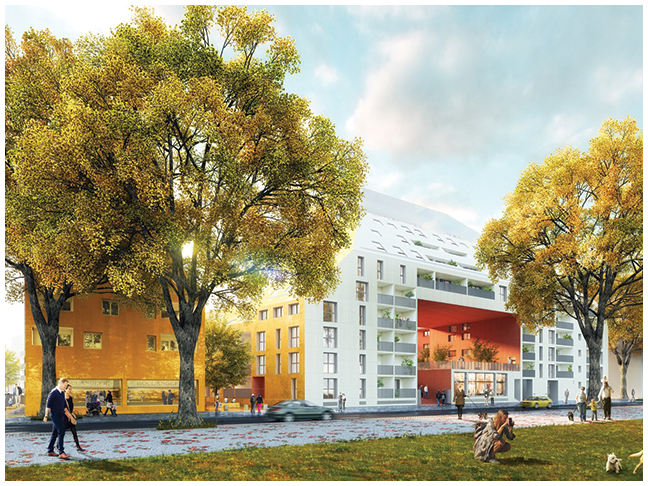 The form of the complex was determined by following four core principles: abundant daylight, natural ventilation, winter light access, and respect for neighbors. The resulting monolithic building features angled cuts that offer views towards the river and the World Heritage Site-designated city center. 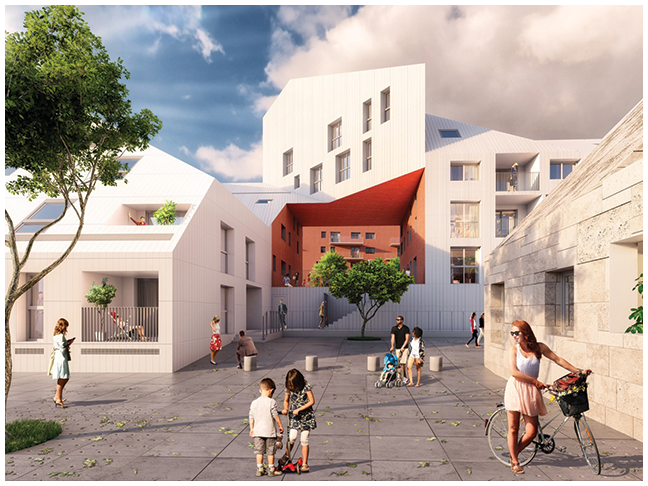 The facades have been carved with 45 degree angles to open up the building in response to the climate and to create innovative housing arrangements.